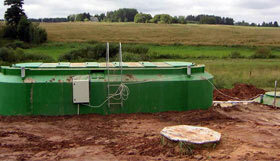 BIOCLERE is a small sewage treatment plant with guaranteed reliability. Correctly planned and installed, it can run for years without any problems. Changes in the weather do not have an effect on the processes that take place in the thoroughly insulated closed treatment plant, witch is designed for northern conditions.BIOCLERE is an ideal solution for areas that lack public sewerage. BIOCLERE removes all major pollutants: floating solids, suspended matter, organic matter, phosphorus and ammoniacal nitrogen. The up-to-date BIOCLERE B has been developed over a period of twenty years on experience gained from eight thousand treatment plants. Consequently it has many advantages compared to other small sewage treatment plants: filter media that does not need changing, the power consumption is low and size compact – just to mention the major ones. The rate of flow through the filter is constant all year round. When the influent decreases, the filter is fed with wastewater from the pump pit, andwhen it breaks completely off, the filter biota is sustained by water accumulated in that pit. BIOCLERE B is a simpel construction, reliable and cheap to purchase and maintain.The treated effluent is discharged e.g into a ditch, a brook etc.In the case of favourable natural condition it may be infiltrated into the ground. How is the wastewater purified? The plants BIOCLERE are designed to biological treatment of wastewater of small and medium size objects. If nessesary, chemical treatment can be added. BIOCLERE B is efficient in removing organic and other pollutants.Biological purification is preceded by mechanical treatment in a double- or triple-chamber septic tank. The septic tank effluent accumulates in a pump pit, situated beneath the biological filter, from which it is pumped to the filter surface and further on trickles through the filter medium. Upon the filter medium elements a biological film, inhabited by bacteria, which break down organic matter, is formed. The bacteria are supplied with oxygen by a fan. The water that percolates through the filter falls into the pump pit and continues to circulate through the filter until it is replaced by fresh influent. A part of the biological film sloughs off, settles to the bottom of the pit, and is eventually removed. For removing phosphorus and ammonia nitrogen, additional units are used. i.e. conventional biological treatment, purification units, which consist of a septic tank and a biofilter Bioclere B, are used. In the septic tank floating matter, sand and coarse suspended matter is detained, while the biofilter removes dissolved organic and fine suspended matter. Triple-chamber factory-made fibre glass septic tanks (3 to 50 m3) are available. The mechanically treated wastewater is channelled from the septic tank into a pump pit situated beneath the biofilter. A submersible pump circulates the water through the biofilter medium. The biofilter consists of an insulated fibre glass container, plastic medium elements, and a distributor that sprinkles water onto the filter surface. Upon the medium elements a biological film, inhabited by bacteria, which break down organic matter, is formed. The bacteria are supplied with oxygen by a fan. A part of the biological film sloughs off, settles to the bottom of the pit, and is eventually removed. The pump pit, which functions also as a secondary clarifier, may be ordered along with the filter, but one can also build a reinforced concrete pit oneself. The larger models (B22B and onwards) are equipped with a submersible sludge pump for removing humus sludge to the septic tank, from which it is periodically hauled away. The prefabricated full set (septic tank, pump pit and biofilter) is easy to assemble (in one to three days) and requires little on-site construction work. If one chooses to build the pit oneself, it will take more time and special attention should be paid to its water tightness. Thanks to their compactness and aesthetic design of above-ground parts, the treatment plants Bioclere B fit well into any surroundings. The plants are odour-free and may be located close to dwellings. Phosphorus is removed by chemical precipitation. For this a supplementary Bioclere K is necessary. The upper part of this unit, supported by an underground clarifier, consists of a precipitant container, dosing unit, operating platform and a control board. The clarifier contains a flocculation chamber, overflow troughs and a sludge pump. If in addition to organic matter there is a need to remove ammoniacal nitrogen, a Bioclere N should be added, which has a special filter medium for nitrifying bacteria. The wastewater treatment plant BIOCLERE is patented and has been tested in many countries (USA, Sweden, Great Britain, Finland, etc.). A normally functioning unit removes 90%-98% of organic matter, suspended solids and phosphorus. The power consumption of treatment plants Bioclere B is very low. Their installed power is as follows: B10...B22 0,7 kW, B30...B180 1,1 kW, B280...B415 2,2 kW (all 220 V, 50 Hz with a 10A fuse). Generally only 50...60 % of installed power is actually used.